We invite you to worship with us on Sundays and for special services. We also off er a number of musical programs throughout the year that we feel sure you would enjoy. Whoever you are, from wherever you have come, you are always welcome at Calvary. 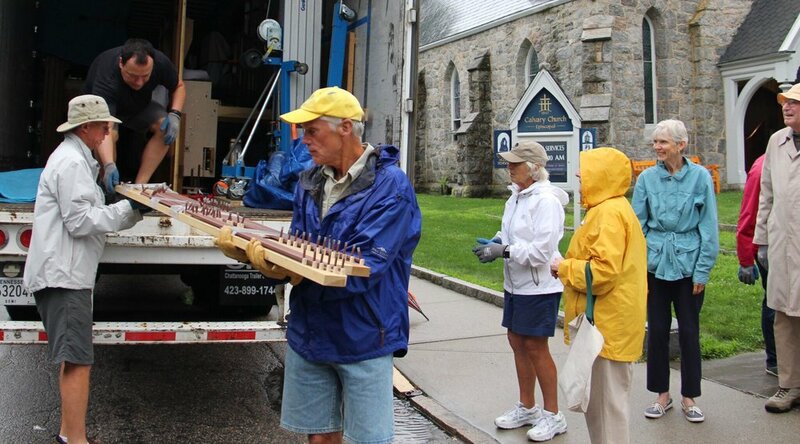 The voyage to bring a new tracker organ to our village church by the sea involved many hands with many skills. 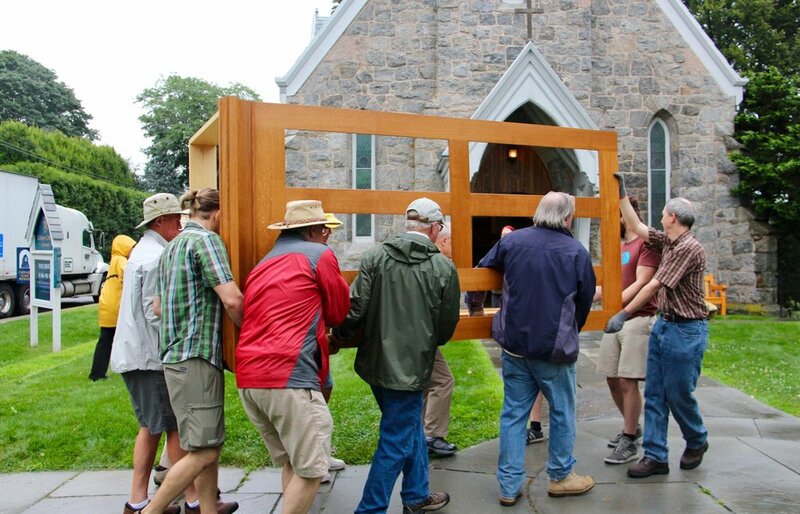 We cast off thanks to key gifts from the Van Rees family that successfully encouraged other families and individuals to make contributions to commission a hand-crafted, fully-voiced, 17-stop pipe organ designed specifically for the acoustics in our church. The search to find a suitable vessel began four years ago, led by Alix Van Rees, Neal Van Rees, Alissa Storrow, Lois Cole, Shirley Wick, and Joseph Ripka. Most churches have to look outside their congregations and staff to find a technical advisor. Calvary Church was blessed to have Joseph Ripka on hand. He acted as our technical director while fulfilling his duties as organist, choirmaster, and artistic director of Calvary Music School. Throughout, Calvary has had the benefit of home-grown talent, staffing the sheets and halyards of this complex endeavor. The selection committee cast its net far and wide, nationally and internationally. 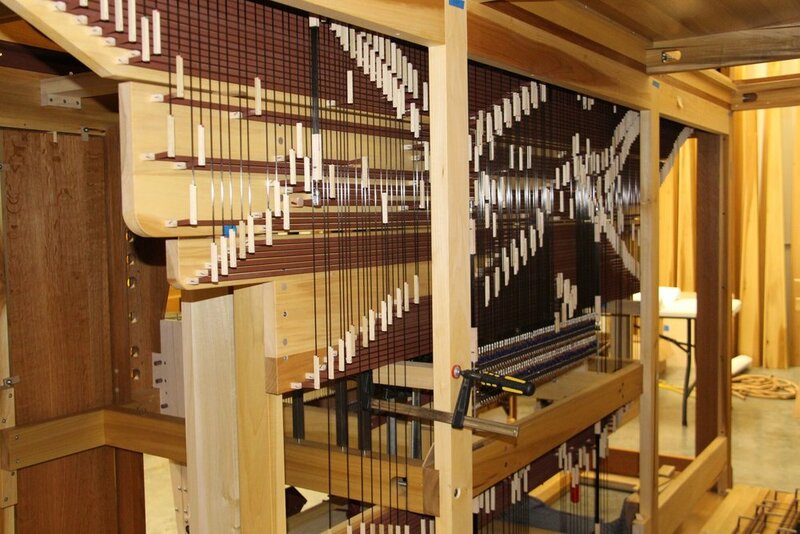 It selected Richards, Fowkes & Co., a “made in the USA” firm that had built over 20 hand-crafted tracker organs throughout the United States, as well as a new organ housed in the historic case at St. George’s, Handel’s home church, in Hanover Square, London. After informational presentations to the parish and a review of contracts by in- house experts, with Vestry approval, we launched our voyage. Mid-way, a change of watch occurred, bringing on board Bill Rutherford, helmsman; Father Alfred Tisdale, navigator; Shawn Cabral, ship keeper; and Frederick Ball, forward lookout and advisor. Shirley Wick remained as signalman and photographer, while Joey Ripka continued as a much-appreciated liaison with the builders to bring our vision to reality. Finally, last July, we brought a magnificent instrument to port in our beautiful stone church overlooking the sea. Not the least of our concerns was a safe harbor. Candace Sanford and her father Edward Davis stepped forward with generous donations to rebuild the balcony loft “strong, dead flat and level” to support the organ and choir. New expert hands joined the crew. Alan McNeely assisted in removing the old 30 stop Wicks organ and found new homes for its pipes and manuals. Builder Robert Wood repaired scars on the west and north walls. Karl Bagwell, owner, and Wes Hinds, superintendent, of Yankee Remodeler who carefully disassembled and reconstructed the balcony. Chad Vogt, PE of E2 Engineers prepared the structural design and resolution of construction surprises. Mike Rogers of SE Electric who safely kept us up to code. Stonington Building Department and Fire Marshall for permitting, design and construction review. There are many others, unsung seamen who include church staff, volunteers who unloaded organ parts as they arrived on trucks, and people who opened their homes to our organ builders. 1847: Jardine & Sons. One manual & pedal. Originally located in the children’s chapel and moved into the new church. 1870: Wilson-Bolan Organ Co. of Providence, RI. Expanded the Jardine to two manuals & pedal. 1915: Hall Organ Co. of West Haven, CT. Electrified and expanded and/or replaced the Wilson-Bolan. 1964: Wicks Organ Co. of Highland, IL. New three manual and pedal, direct electric action organ. 30 Stops. 2017: Richards, Fowkes & Co. of Ooltewah, TN. New two manual and pedal, mechanical action organ. 17 Stops. Bruce Fowkes and Ralph Richards founded Richards, Fowkes & Co. in 1988. As trained organists and church musicians, they combined their individual training and organ building skills in partnership. After studying organ at Brigham Young University and Utah State University, Bruce apprenticed with Michael Bigelow in Provo, Utah and Matthew Copley in London, England. He later worked for John Brombaugh in Eugene, Oregon. Ralph studied organ at Oberlin College after which he did a short apprenticeship with John Brombaugh. In 1977 he and Paul Fritts started their own company, Fritts-Richards Organ Builders, in Tacoma, Washington. Over the past three decades we have studied the great masterpieces of European organ building looking for inspiration to help create new instruments that are pertinent to our own liturgical needs today. Although we do not copy antique instruments, we strive to capture the essence of what makes these organs great. Research begun by a previous generation of builders in the 1960s has helped us learn the theories and building practices of these iconic instruments. It is because these historic instruments have proven to be incredibly colorful, versatile, and enduring that we look to them for inspiration in our own work. Opus 23 for Calvary Church continues that same tradition. The organ case at Calvary Church, which is inspired by extant American organs built during the 1840s, contains the 1008 pipes of the organ. It is constructed from quarter-sawn white oak and poplar using traditional joinery methods and finished with Danish oil and hand rubbed wax. The manual keys are covered in boxwood with ebony accidentals, and the pedal keys are covered in maple with ebony sharps. A simple mechanical action gives the player intimate control over the timing, attack, and release of notes. This is commonly referred to as tracker action. Mechanical action helps deliver air to the pipes in a gentle manner that allows a more natural and relaxed style of voicing than modern electrics. This time- honored simplicity also contributes reliability and longevity. In consultation with Joseph Ripka, we took the unusual course of enclosing the majority of the pipes in a single swell box. In addition, we have included the Viola da Gamba 8 and Celeste 8 on Manual II while reversing the traditional placement of the Oboe 8 and the Trompet 8. This affords an organ of modest resources greater control and nuance possibilities for accompanying choir anthems and the liturgy. Opus 23 Organ built by Richards, Fowkes & Co: John Brown, Trent Buhr, Bruce Fowkes, Karla Fowkes, Nathan Govig, Alex Haas, Rick Mcusic, Brian Miscio, Nathan Perry, Jordon Schilleman, Patrick Spiesser, Dean Wilson, Andy Wishart. With additional help from Russell Draeger, Patrick Fischer, Joshua Knight, Nathalie Spiesser, Christy Spiesser, Jesse Mozzini, and special thanks to Richard Schulze. Carlisle Chandler McIvor was a humanitarian, a beloved brother, a teacher, and a friend to all, great and small. In memory of “this gentle man of many talents who used them for the good of others,” Calvary choir member Alix McIvor Van Rees gave the leading gift to commission a new tracker organ for Calvary Church named the “Chandler McIvor Organ”for her brother. computer, teaching computer literacy and Carlisle Chandler McIvor coaching many young people to pursue careers in internet technology. provided a major supporting gift in memory of his father Cornelius R. Van Rees who was a noted organist in New York City, serving from 1922 to 1954 as Organist and Minister of Music at the Baptist Temple in Brooklyn, directing the 100-voice Temple Choir that performed at the 1938 World’s Fair. made a major gift in loving memory of Dorothy Davis, her mother and his wife. It was for the complete rebuilding of the choir/organ loft that had become seriously compromised structurally. Throughout the 1980s and 1990s, Dorothy (Dee Dee to family and friends) was a faithful Calvary Choir member, climbing the stairs to the balcony each Sunday to sing the praises of God. Following Mr. Davis' death, the gift is now in memory of both her parents, Edward and Dorothy Davis. contributed a generous gift in his memory. Rudi was a Calvary member who loved great organ music and enjoyed playing the organ himself. Their gift of the 16’ Posaune (Trombone) rank of pipes forms the bass anchor for congregational singing and performance. gave a generous gift not only to support the building of the organ but to encourage its use for education in the larger community. Charles and Irene have a special love for the education of children and youth and hope their gift will enrich the next generations. are strong supporters of music at Calvary. Their special gift of the 8’ Rohrflöte rank of pipes is foundational for supporting singing both by the choir and congregation. in loving memory of Lois’ mother Astrid Christine Hallonquist funded the Cymbelstern (Zimbelstern) stop, celebratory bells that are joyously rung from the organ console. loves to play the flute, and her husband especially enjoyed her music. In memory of her dear husband Emory D. Ayers, Susan has given the Spitzflöte 4’ flute rank. gave a special gift to help install our magnificent organ that will bring such joy, in loving memory of Charlie who had a knack for making the lives of those around him more joyous and beautiful. made a gift to the organ fund as a loving tribute to Alice M. Jewett who was closely tied to and loved Calvary all her life. made a special gift to the organ fund in loving memory of him. gave a kind gift in honor of Alisa “Schwestie” Storrow. made a gift in thanksgiving for Henry’s baptism. made a gift in honor of Erin, Joseph, and Clara Ripka. made a gift for the restoration of the staircase to the balcony organ loft. For the many and varied additional gifts given by individuals, we are thankful.